For the song by Assembly Now, see Leigh-On-Sea (song). Leigh-on-Sea ( /ˌliː-/), also referred to as Leigh, is a town and civil parish in Essex, England. A district of Southend-on-Sea, with its own town council, it is currently the only civil parish within the borough. Leigh-on-Sea is situated on the northern side of the Thames Estuary, only a few miles from the open waters of the North Sea to the east, and a similar distance from the Kent coast to the south. The coastal environs of the town feature a nature reserve at Two Tree Island and a centrally located beach adjacent to Bell Wharf. At low tide, Leigh's foreshore has a wide expanse of mud flats and creeks, extending offshore towards the deep water channel of the Thames (Yantlet Channel). Leigh is approximately 40 miles from central London via road and rail networks and is considered part of the London commuter belt. Archaeological finds of pottery and coins from the Romano-British era in the locality suggest early settlement. From at least the Saxon period a hilltop clearing amidst the woodland that covered much of the surrounding area (the Rochford Hundred) of Essex came to be known as Leigh (alternatively given as 'Ley', 'Lee' or 'Lea' on old maps). A place of minor economic importance at the time of the Norman Conquest, a reference to Leigh (Legra) appears in the Domesday Book survey of 1086. Ley is a place-name element found also in the nearby towns and villages of Hadleigh, Rayleigh, Hockley, and Thundersley. From the late Middle Ages onwards, Leigh evolved from a rustic backwater through eras of increased and diminished maritime trade to form, by the early 20th century, the westernmost suburb of the borough of Southend-on-Sea. Beyond the fishing and trading settlement on the shore of the Thames Estuary, a number of farms including Leigh Heath Farm, Leigh Park Farm, Chapmans, Belfairs Farm, Gowles/Gowlds, Picketts, Owls Hall Farm, Wood Farm, (Adams/Allens) Elm Farm, Plastow and Leigh Hall Farm existed. The parish church, St. Clement's, was rebuilt in the late 15th century or early 16th century, although the list of Rectors dates back 1248. The fabric of the church is of Kentish ragstone and flint rubble, with a Tudor porch constructed of red brick. The medieval structure of the church was added to and altered during the 19th and early 20th centuries. The chancel was extended at the east end in 1872 by C F Haywood, E Geldart added the south aisle in 1897, and there were a number of alterations made by Sir Charles Nicholson in 1913 and 1919. The tower at the west end was a prominent landmark for shipping on the Thames Estuary, and the building contains a good selection of stained glass dating from between the 18th and 20th centuries. The building is Grade II* listed by Historic England, and a key factor for this rating was the sympathetic nature of the 19th and 20th century additions. The Rt Rev Robert Eden, who became Leigh's rector in 1837, demolished the existing rectory and commissioned a large new one, which was completed in 1838. One quarter of the building remains today as Leigh Library, as the other wings of the building were demolished by Southend Corporation when they acquired the building and the surrounding land. The rectory and grounds occupied a 6-acre (2.4 ha) site, and the work carried out by Eden included the construction of Rectory Grove as a public right of way, which replaced an existing cliff-top path called Chess Lane, and a second trackway between Elm Road and the springs situated near the top of Billet Lane. In the 11th century Leigh was a marginal community of homesteads. The Domesday Book records 'five smallholders above the water who do not hold land', who were probably engaged in fishing thus giving Leigh a claim to nearly a thousand years of activity in the fishing industry. The main seafood catch from Leigh fishing boats has always been shellfish and whitebait. Many of the local trawlers were at one time bawleys, and two of Old Leigh's pubs – the Peter Boat and Ye Olde Smack – owe their names to types of local fishing boat. Local fish merchants land, process and trade a wide range of supplies daily, including shrimps, lobster, crab, seabass, haddock, cod and mackerel, cockles, whelks, mussels and oysters. The riverside settlement of 'Old Leigh', or 'The Old Town', is historically significant; it was once on the primary shipping route to London. From the Middle Ages until the turn of the 20th century, Old Leigh hosted the settlement's market square, and high street (known as Leigh Strand). Leigh had grown to become a prosperous port by the 16th century; ships as large as 340 tons were built here for fishing and other purposes. Elizabethan historian William Camden (1551-1623) described Leigh as "a proper fine little towne and verie full of stout and adventurous sailers". By the 1740s however, Leigh's deep water access had become silted up (as attested to by John Wesley) and the village was in decline as an anchorage and port of call. With the advent of the railway line from London to Southend during the mid-19th century, much of the "old town" was demolished to accommodate its passage, and new housing and streets began to be built on the ridge of hills above the settlement. In recent years, Leigh-on-Sea has frequently been cited as one of the best places to live in the UK, owing to factors such as: its proximity to London, nearby outstanding Westcliff and Southend grammar schools, good access to sports and arts activities, multiple opportunities to develop skills, and a strong sense of belonging and community spirit. A 2016 survey by Rightmove found that Leigh was the happiest place to live in the UK. Leigh-on-Sea is served by Leigh-on-Sea railway station on the London, Tilbury and Southend Railway. Regular, daily bus services run between Southend-on-Sea, Benfleet, Canvey Island, Basildon, Rayleigh and Chelmsford. Scheduled flights to national and European destinations operate out of nearby London Southend Airport. Leigh-on-Sea is a district of Southend-on-Sea, which includes the electoral wards Belfairs, Blenheim Park, Leigh and West Leigh. The two latter electoral wards and one Poll District of Belfairs and Blenheim Park Wards are included in the Leigh-on-Sea Town Council area, which is a civil parish. The population of the entire district taken at the 2011 Census was 38,931. Phill Jupitus, comedian, who moved to Leigh in 2000. Helen Mirren, actress, born in Hammersmith, was brought up in Leigh-on-Sea. Peggy Mount, actress, was born in Leigh-on-Sea on 2 May 1918. ^ "Civil Parish population 2011". Retrieved 21 September 2015. ^ Office for National Statistics, Office for National Statistics. "Social Cohesion in London". ^ "Leigh Beck Archaeology and RHFAG | The Vanishing Past | Archaeology on Canvey | History | Canvey Island Archive". www.canveyisland.org. Retrieved 2017-05-31. ^ Williams, Judith (2002). Leigh-on-Sea: A History. Phillimore. p. 40. ISBN 978-1-86077-220-7. ^ Historic England. "Church of St Clement (1322326)". National Heritage List for England. Retrieved 30 July 2017. ^ "Leigh Library - The Original Rectory". leigh-on-sea.net. Retrieved 30 July 2017. ^ "North Thames Fisheries local action group". Thames Estuary Partnership. Retrieved 30 July 2017. ^ Camden, William. "Essex". A Vision of Britain through time. Retrieved 30 July 2017. ^ Wesley, John. "The journal of John Wesley". A Vision of Britain through time. Retrieved 30 July 2017. ^ "Leigh Town Council". Retrieved 5 October 2018. 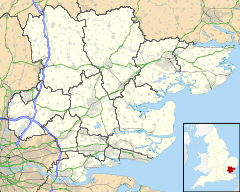 ^ "Which Essex town has been named fourth best place to live in the UK?". Echo. Retrieved 2017-01-20. ^ "Where is the happiest place to live?Property News | Property Blog | Rightmove". Rightmove Property News. 2016-08-16. Retrieved 2017-01-20. ^ "Leigh on Sea Train Station | Your Guide to Leigh on Sea by Train". c2c. Retrieved 30 January 2019. ^ "Local bus, coach and rail information". Carl Berry. Retrieved 30 July 2017. ^ "Destinations". southendairport.com. Retrieved 30 July 2017. ^ "Southend Ward (Leigh) population 2011". Retrieved 21 September 2015. ^ "Orbiting Jupitus". Essex Life. Retrieved 31 July 2017. ^ "Heln Mirren interview". The Telegraph. 7 February 2011. ^ "Peggy Mount". The Guardian. 14 November 2001. Wikimedia Commons has media related to Leigh-on-Sea.